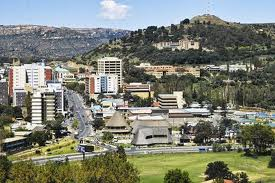 Today, I would like us to look into Maseru, the capital of Lesotho, a landlocked country located inside South Africa. 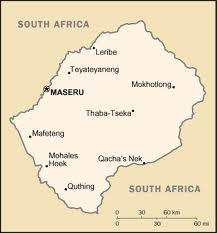 Maseru is a Sesotho word which means “the place of the red sandstone.” Maseru is located on the Caledon river, directly on the border with South Africa. The city was first established as a police camp, and later on became the capital of the country when it was under British protectorate. Maseru lies in a shallow valley in the Hlabeng-Sa Likhama foothills of the Maloti mountains. Its elevation is 1,600 m above sea level. Lesotho is the world’s highest altitude country, in other words, it is the only country in the world which lies 1,000 m above sea level; its lowest point of 1,400 m is thus the highest in the world. Over 80% of the country lies 1,800 m above sea level. 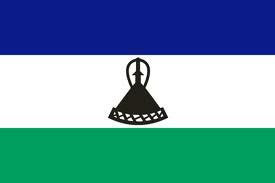 Lesotho is the land of the Sotho people, and the official languages are Sesotho and English. One may wonder how come such a small country (just over 30,000 km2) could reside independently inside South Africa, when we know very well the Boers’ expansion in South Africa and their thirst of land. Well, in June 1838, when the TrekBoers attacked the country, the King Moshoeshoe I signed a treaty with the British governor of the Cape colony. After fighting several wars with the Boers from 1858 to 1868, King Moshoeshoe I sought British protection who agreed to make Basutoland into a British protectorate in 1868. In 1869, the British signed a treaty at Aliwal North with the Boers that defined the boundaries of Basutoland, and later Lesotho, which by ceding the western territories effectively reduced Moshoeshoe’s kingdom to half its previous size (see… the colonists never really helped, they just assigned themselves big part of African kingdoms, like that pie Africa became after the Berlin Conference in 1884). Enjoy this video, and discover Maseru. I enjoy what you guys are up too. This kind of clever work and reporting! Keep up the fantastic works guys I’ve added you guys to blogroll. That was very informative. The highest places I’ve been to were Quito and Zumbahua, Ecuador which was a huge difference from being a from a flat state in America. Haha! That is interesting about Lesotho and I didn’t know about the capital and how it was separate from the rest of South Africa. There are times where I feel bad because I’ve always pronounced that country “Les-OH-Tho” since I was a kid until I heard the real pronunciation from a random YouTube video where I was severely corrected. Altitude is everything, isn’t it? It does make a difference! That’s so true. When I was in Zumbahua, it took more energy to go up places since it was 12k+ feet above sea level and built on an extinct volcanic lagoon. Wow… I would love to visit! If you ever check out Ecuador, I would recommend Quito (the capital), Zumbahua, Banos de Agua Santa, Guayaquil, and the Galapagos Islands. There are beautiful places in that country.